We offer infiltration testing for infiltrating BMP's (Best Management Practices). The Simple Infiltration Test is a small-scale infiltration test procedure adapted from the Washington State Department of Ecology (Ecology) Rain Garden Handbook for Western Washington. This consists of digging a minimum 2 foot wide hole by 2 foot deep hole. 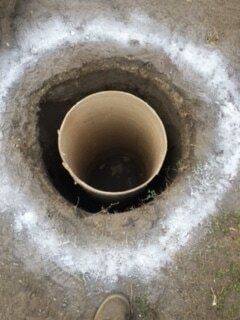 Next we complete a ''pre-soak period in which we fill the hole with 12 inches of water. We will take 2 measurements...At hour #1 and hour #2. Depending upon the amount that the water infiltrated will determine how often measurements are taken and for how long. Once the test is fully completed we will complete a report to give to the city of Seattle for review. ​Contact us for a quote!